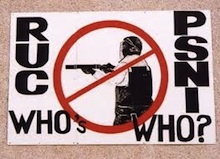 More than three quarters of the civilian staff employed by the PSNI on temporary contracts were formerly in the RUC. Nearly half of them are now employed in the PSNI’S Special Branch. The PSNI (Police Service of Northern Ireland) was created in 2003 to replace the notorious RUC (Royal Ulster Constabulary) as part of the Patten reforms of policing in the North which followed from the 1998 Good Friday Agreement. The legislation stated that those who were paid off to leave the RUC with a hefty “retirement package” would have to pay it back if re-employed by the PSNI. But the prohibition has not prevented the PSNI from rehiring some of its most controversial officers -- in a civilian capacity. For years now, Sinn Fein and the SDLP have been asking the PSNI to provide details of the number of former RUC men rehired. Repeatedly they were told it was not possible to provide the details because the force did not keep a record of the past employment of civilian staff. But it has finally been revealed that the PSNI is currently using the services of 399 staff supplied by a recruitment agency on contracts -- and that 304 of them are former RUC men. Another document reveals that nearly half of these are involved in the most controversial areas of policing, the ‘intelligence’ division (Special Branch), notorious for its history of collusion in political and sectarian killings. The rehirings of almost 150 senior RUC figures have added significant weight to claims that genuine policing reform has not taken place in the North. “This is about good policing, this is about good governance of policing, and really you wouldn’t get away with this in any other organisation,” said Sinn Fein Policing Board member Gerry Kelly. “Many of these former officers are now involved in very sensitive roles, but they are not accountable to the police ombudsman, they are not accountable to the Policing Board, they do not take the police oath and they are not accountable in terms of the code of ethics. eirigi’s Breandan Mac Cionnaith said the revelations would come as no surprise to republicans who have been “on the receiving end of brutality and abuse at the hands of these thugs”. He said his party had “stated all along that this force remained nothing but the same force it always was, bar a few cosmetic changes, and this now proves that we were right. They are simply the same old wine in new bottles. He said there had been an attempt to portray the PSNI as a fresh new beginning with promises of accountability and fairness. In a separate development, it also emerged this week that reports on two killings sent to the PSNI have mysteriously disappeared, throwing the inquests into chaos. The North’s senior coroner John Leckey expressed incredulity that copies of two reports from the Police Ombudsman’s office had vanished without a trace. At a preliminary hearing into the deaths of Gareth O’Connor and of Gerard Lawlor, a PSNI lawyer told the court that files on the Ombudsman’s investigation into their handling of the cases had never reached the PSNI team who had requested them. Armagh man Mr O’Connor, who had just been charged with membership of the ‘Real IRA’, was abducted and killed while en route to Dundalk in 2003. Gerard Lawlor, a 19-year-old Catholic from north Belfast, was gunned down by the UDA in a sectarian attack in 2002. PSNI lawyer Ken Boyd, said the force had written to the Ombudsman in June 2010 seeking a prior copy of the report on the death of Gerard Lawlor to consider whether parts should be removed before it was given to the Lawlor family. Although the Ombudsman’s office said the report was believed to have been sent, it was now lost without trace.